IDW Publishing announces a partnership with OMINOUS PRESS to bring a new line of epic adventure comics to the market. The brainchild of comic art master Bart Sears, Ominous Press will tell stories of larger-than-life heroes and villains in fantasy and science-fiction settings. Ominous Press had a brief, initial life in the mid-'90s, before the crash of the comic market brought down so many fledgling publishers. Now Ominous Press returns, releasing all-new material through IDW beginning in July. Ominous Press is comprised of Chief Creative Officer Bart Sears, Publisher Sean HusVar, Editor-in-Chief Ron Marz, and Art Director Andy Smith. 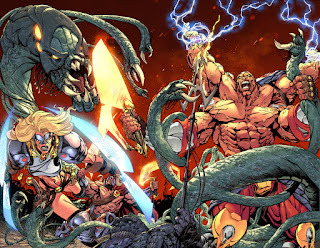 The initial lineup of Ominous Press titles is: "Dread Gods," written by Ron Marz and drawn by Tom Raney, in which gods in a fantasy world discover they're actually monsters in a post-apocalyptic hell; "Giantkillers," written and drawn by Bart Sears, telling the story of a broken warrior who must protect a child destined to be the universe's last hope against the ultimate villain; and "Demi-God," written by Ron Marz and drawn by Andy Smith, about a fame-seeking hero gaining great power, but forgetting the great responsibility part. "Telling your own stories, the way you want to tell them, is the dream of everyone creating comics,” said Sears. “Ominous Press partnering with IDW gives all of us the chance to do just that. These are the kind of epic stories we grew up on, the kind of stories that made us want to create comics in the first place." Ominous Press Publisher Sean HusVar said, "I'm so pleased that Ominous has become part of the IDW family. We couldn't ask for a better home, and I have every confidence that this will be a long and prosperous partnership." Each title will initially launch as a four-issue mini-series. Each series stands alone, intended to be read independently, but with connecting plot threads that create a larger canvas. "Dread Gods" will be the first title, with issue #1 debuting in July. "Dread Gods" #1 will have a standard cover by series artist Tom Raney, a wraparound cover by Bart Sears, and incentive covers by Kenneth Rocafort (1-in-10) and the legendary Neal Adams (1-in-25). "Dread Gods" #1 will be an oversize 48-page issue, including the lead feature by Marz and Raney, a backup story by Bart Sears, and a wealth of additional content, all for $3.99. "Giantkillers" and then "Demi-God" will follow. The marriage of Ominous Press and IDW was spearheaded by IDW Editor-in-Chief David Hedgecock. “Ron, Bart, Andy, Tom and the rest of the Ominous team are bringing something to IDW that any publisher would desire – powerful storytelling,” said Hedgecock. “When you have books of unmitigated quality matched with some of the industry’s brightest talents, telling a powerful story, the thought of NOT publishing these stories would be ludicrous!" Ominous Press will have a presence with IDW at July’s Comic-Con International as the publishing line launches.